Leimert Park Village leapt to life this Martin Luther King Jr. Day as families filled the sidewalks surrounding the intersection of Crenshaw and West Martin Luther King Jr. boulevards to watch the Kingdom Day Parade and join in festivities honoring the holiday’s namesake. Marching bands and drill teams from Beckman, Crenshaw, and Inglewood High Schools, among others, filled the streets with bold, brassy music as Los Angeles City Council members waved to their constituents from slow-moving convertibles. At the end of the parade route, booths had been set up selling everything from food to tote bags to King-inspired T-shirts. Crenshaw High School freshman and marching band member Tierney Shellmyer relaxed in the shade under the awning of the Vision Theater. He said it was hot marching and playing in a heavy uniform, but he was glad to be able to be a part of the day’s events. Radio station KJLH set up a stage in Leimert Park where local singers performed gospel songs or music that reminded them of King. During a break in the music, 8th District Councilmember Bernard Parks took the stage and introduced Congresswoman Maxine Waters, who had flown in from Washington for the weekend. Waters noted that while there is plenty of cause for celebration, today’s holiday does have a more serious side. For Waters, that first order of serious business back in Washington is making sure the health care reform bill is not repealed. On the sidewalks, however, kids eating snow cones, clowns crafting balloon animals, and high school friends hugging after a successful parade performance made it hard to stay too serious for too long. 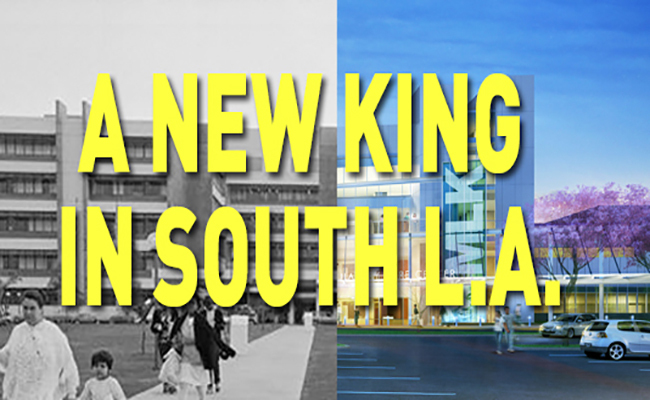 Inglewood pays tribute to legacy of Martin Luther King Jr. This uplifting triad echoed through Inglewood, Calif., Saturday morning as hundreds of community members filled the Tabernacle of Faithful Central Bible Church to honor the accomplishments of Martin Luther King Jr. The words composed the 28th Dr. Martin Luther King Jr. Day Celebration theme, which also prompted the city’s annual student speech and art competitions. Monroe Middle School student John Cruz, one of the four speech competition winners who spoke in front of the church audience, displayed his self-assurance both on and off the stage. Student competition winners presented their speeches and art during the two-hour ceremony, which included performances by spoken-word artist Azure Antoinette, the Inglewood-based Parent Elementary School Choir and the Spirit of David Choir, which was a finalist in a national choir competition hosted by Verizon Communications, Inc., at Staples Center in October. KTLA Morning Show host Michaela Pereira served as mistress of ceremonies and actor Gbenga Akinnagbe served as grand marshal. The annual celebration strikes a personal chord with Inglewood, as the city was one of the first in the nation to declare Martin Luther King Jr. Day a legal holiday, according to the City of Inglewood website. But due to recent budget cuts, an annual march to Hollywood Park following the church ceremony was removed from the agenda. The three-mile crossing symbolized civil rights marches from the 1960s. Families with young children made up most of the audience at the youth-centered celebration, but some attendees stood solo as longtime veterans of Martin Luther King Jr. events. “There are some people who, no matter what type of event that honors Dr. King, they’ll be there,” noted Sabrina Barnes, director of Inglewood’s Parks, Recreation and Community Services. William Brown, retired U.S. Postal Service employee and Inglewood resident, expressed unease at this year’s smaller turnout. After the event, organizers encouraged attendees to continue the celebration beyond the morning’s ceremonies, such as at the Martin Luther King Jr. Peace & Unity Parade Celebration in Long Beach, Calif., at which a festival was held until 5 p.m.